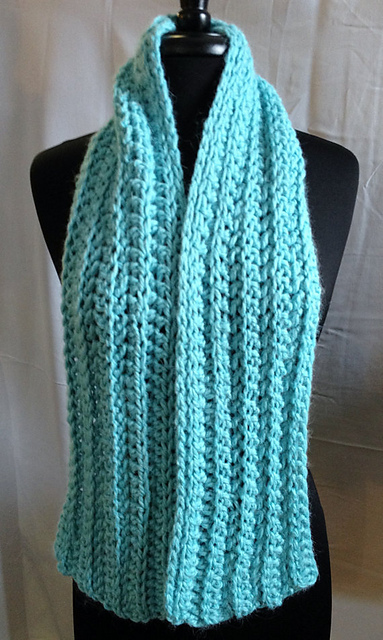 This Easy Mistake Stitch Scarf is a pattern I like to use when teaching people how to knit. This pattern is from the Purl Soho website. I have adapted the pattern to use with our bulky Snuggle Yarn from the Alpaca Yarn Company, and big needles, so fewer stitches are needed when casting on than what is written in the original pattern. This scarf will take two skeins of yarn, which will require joining a new skein of yarn. If possible do this at the end of the row. Repeat the pattern for 60 inches or to desired length. That’s it! If you plan to knit until you run out of yarn, you will need to be sure you will have enough yarn left to bind off. Figure out how much yarn it takes you to knit one row, plus some extra. You can measure off a few yards and then determine whether your row takes you more or less. This will give you an approximate amount of yarn necessary to bind off. Bind off stitches in stitch pattern. Be sure to bind off loosely or the pattern will be “gathered” at the bound edge. If you find the edge is too tight when binding off, use a larger needle to bind off. Also, be sure to form the stitch on the straight part of the needle, not the tip. Next, you will want to weave in the ends and block your scarf. Blocking is an integral part of finishing a knitted item. It will even out your stitches and allow your fiber to bloom! Be sure to check out the FREE Knitting Tutorials from Craftsy! You might also want to check out 10 Easy Scarf Knitting Patterns for Beginners and more Free Knitting Patterns on this website. I liked this cowl pattern so much that I made three of them! I did use three different color combinations, not sure which one I like the best. The pattern is called Stormy Weather Cowl by Tamara Kelly. It works up very fast with our bulky Snuggle yarn and a big hook. The colors I used for the one below are Winter Sky and Pine Tree. Love the zig zag design that is accomplished by going two rows down to create the stitch, a little tricky, but no big deal once you figure out where to put your hook! 32 inches (81.28cm) and the width is 7 inches (17.78cm). This pattern is not worked in successive stitches, but rather in successive chain spaces – two rows down. It makes for a very closed fabric with lots of interest, but it’s not as hard as it might sound! To make the cowl longer, add any multiple of 2 to the starting chain/first round. If you want a closer fitting neck warmer, just decrease by any multiple of 2. This cowl is made with Snuggle yarns Pine Tree and Tan Heather. This color combination is Tan Heather and Winter Sky. This color combination is Snow White and Gray Heather. Be sure to see the Stormy Weather Cowl Tutorial and Video on the Moogly blog for further help! This Jessica Scarflette crochet pattern is by Jessica Dassing of Chick-a-Pea Studio. Any weight yarn will work using the appropriate hook, as there is no fit to this scarflette. I used one of our Swizzle Yarns, a DK weight, and 100% alpaca. The color is called Punk Rock Princess, now isn’t that a fun name? Button holes are not necessary since there are openings created by this crochet stitch. When picking out buttons, test out how they fit with your project; button size will vary with gauge and yarn choice. This alpaca scarflette measures roughly 9 inches/ 23 cm wide and 39 inches/ 101 cm long. Chain 28 stitches. These include the extra 3 chains at the start of Row 1. These chains will allow your double crochet stitches to stand up straight. Row 1: 5dc in 4th chain from hook, *skip 2 chains, single crochet into next chain, skip 2 chains, 5 double-crochet into next chain*. Repeat between**s until 3 chains remain. End row 1 with 3 double crochets in last chain. Turn work. Row 2: Chain one,*5 double-crochets into single crochet from previous row, single crochet into middle stitch of shell from previous row*. Repeat between**s until last shell, 3 double-crochet into top of chain 3. Turn work. Rows 3-66: Repeat rows 1 & 2 until desired length. Weave in ends. Sew on buttons along one side. Optional Edging: Continue around the outside border of the scarflette adding shell pattern over and over again, making twice as many double crochets to round the corner stitch. To print pattern, click Jessica Scarflette Crochet Pattern. Click here to see a number of ways this scarflette can be worn, and other yarns used for this project. Seed stitch, also known as moss stitch, is a basic texture stitch. It is made up of alternating knit and purl stitches. The fabric is firm, does not curl, and looks the same on both sides. It is ideal for small knits, scarves, cowls, mittens, gloves, and knits up into super cute baby items! This is a stitch you will want to learn! For this scarf, I used big needles and our bulky Snuggle Yarn. It is a very simple pattern and the texture is so pretty! An odd number of stitches is required for seed stitch. The trick to the seed stitch is knowing when to knit and when to purl. You will be knitting the purl stitches and purling the knit stitches. Starting with an odd number of stitches you will always be starting and ending the row with a knit stitch. Cast on 19 sts loosely. Work in seed stitch, as described below, for 60 inches or to desired length. Bind off stitches. Weave in ends. This scarf is available for purchase in any of the pretty Snuggle Yarn colors! Click here to purchase. To print pattern, click Seed Stitch Knit Scarf Pattern. I use this pattern by Prague Loop over and over. It is easy, mindless and quick, especially with a bulky yarn. Any yarn could be used and any size hook. My favorite yarn to use with this pattern is our Snuggle Yarn. This scarf is worked lengthwise, back and forth in rows, and gauge is not important. Super easy one row scarf, very suitable for beginners. The color of the Snuggle Yarn pictured above is called Seafoam. The color of this Snuggle Yarn is called Winkle. Decide how long a scarf is good for you. Chain an amount of st that is the length you want. The scarves above were made with 100 stitches, though next time I make it I may go a little longer. Enjoy your new scarf or give it to someone! This scarf was made with the same pattern using one of the Hand Dyed Snuggle Yarns called Knot of Naturals. The hand dyed line comes in seven different colors! Any yarn can be used with the pattern, and gauge is not important. This scarf was made with our Swizzle Alpaca Yarn using a 5.5 mm (I) crochet hook and chaining 145 stitches. It took just one skein of yarn for a scarf that measured 60″ long by 5.5″ wide. See Free Crochet Pattern – Swizzle Alpaca Ribbed Scarf. This pattern is called Spring Petals Scarf, a free pattern I found on Ravelry by Ragamuffin. I adapted it for our Astral Yarn and love how it turned out! I used Star Bright White Astral Yarn by The Alpaca Yarn Company. The pattern called for a worsted weight yarn, and Astral Yarn is DK weight, also referred to as light worsted. A little lighter than worsted weight, I figured the DK weight might make the scarf a little bit more lacy looking. And so it did! Row 1 – 3 dc in 5th ch from hook, skip next 3 ch, 1 sc in next ch, *ch 3, 3 dc in same ch as last sc, skip 3 ch, 1 sc in next ch, repeat from *, ending with 1 sc in last ch, turn. Row 2 – Ch 4, 3 dc in first ch, skip [1 sc, 3 dc], 1 sc in ch 3 space, *Ch 3, 3 dc in same ch 3 space as last sc, skip [1 sc, 3 dc], 1 sc in next ch 3 space, repeat from *, work last sc under ch 4, turn. Repeat row 2 to desired length. Finish off and weave in ends. Ch 3, 3 hdc in first sc, *sc in ch 3 space, 3 hdc in first dc, repeat from *, sc in last ch 4 sp. The Astral Yarn is a beautiful blend of 30% alpaca, 20% wool, and 50% Tencel. It has a sheen to it that is gorgeous and so sumptuously lovely to work with. This is the scarf made up in Gold Rush, such a rich, pretty color, especially in the sunlight. Just finished! I tend to use the same pattern over, and over, but hey when you find a good one, why not stick with it? This pattern is from Jane Davis’ book called Felted Crochet. Jane is on Ravelry and has lots of other great projects, you may want to take a look. Anyway, this is a great pattern for experimenting with different kinds of yarn. I did not felt the scarf, but you can, just pay attention. When you are using different yarns, they will felt differently, and of course acrylics don’t felt. I love color, I especially like to mix-n-match colors, and textures, and different types of yarn. Paca Paints Yarns which is another 100% Alpaca yarn, then another one from my stash with some metallic in it. The Alpaca Yarns are available in both The Farm Store Online, and in The Fiber Studio here at the farm. You are currently browsing the archives for scarves.